The Restaurant with the typical dishes of the Italian cuisine! 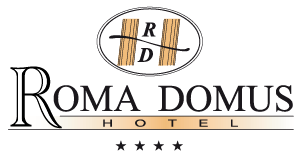 The Restaurant at the Roma Domus Hotel, serves typical dishes of the Roman cuisine, Italian and International, prepared with high quality raw materials, processed with care and presented with refined elegance and professionalism. A great variety of sweet and salty is proposed daily by the Chef, while the products of the cafeteria are served by the staff that will welcome you every day with smiling professionalism and courtesy. The breakfast is the most important meal of the day, then, in the morning a splendid buffet breakfast with Italian and International will be at your disposal in an air-conditioned room with a cozy atmosphere and quiet. Croissants, brioches, coffee, cappuccino and you will be brought to the table, while you relax or plan your visit in the centre of Rome or shopping in the nearby Outlet Soratte.